The latest rumor regarding Cortana in Windows 10 is that the virtual personal assistant might first pop up there in January 2015. With a Windows 10 Technical Preview that includes Cortana supposedly right around the corner, you'd think an example or two of her in action would leak - and as of today you'd be right. Windows news site WinBeta seems to have got its hands on a test version of Windows 10 with a very unfinished Cortana built in, and they published the video below. 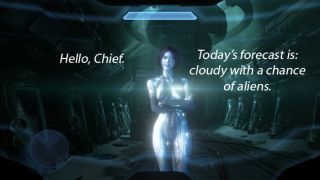 "Before we dive in I must stress that this is an in-development version of Cortana running on pre-release software," the video's narrator says. "That means the user interface isn't finished and features are very buggy." As the video demonstrates the Windows 10 version of Cortana can do almost everything the Windows Phone version can do, from placing Skype calls to setting reminders and much more. The site doesn't seem to have any more clues as to when Cortana will actually arrive in a public build of Windows 10, but the existence of this mostly-functional test version suggests that January might be a good guess after all. Is Sprint ditching Windows Phone?